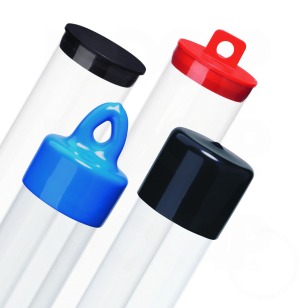 Our inexpensive, thin wall clear plastic tube packaging is recommended for lightweight or non-fragile items such as posters, confectionery products, housewares, novelties, toys or any items that require a unique, yet low-cost package. Both thin wall clear plastic tubes and the ultra-thin plastic tubes provide the protection needed to house a consumer product for retail sale, yet remain economical enough for packaging a promotional item for handout at a trade show. Various styles of end-cap closures are available that feature standard or hanging capabilities. For more information, see our TW Series page.